To promote Pixie Bobs, educate and inform about the Pixie Bob breed, and support ethical breeding and rescue programs. We achieve these goals by making accurate, detailed information available, producing healthy, well-socialized Pixie Bob kittens, listing Pixie Bobs for adoption, and assisting owners, breeders, and admirers of the Pixie Bob according to our ability. generally making ourselves available to assist anyone in the Pixie Bobs community. A Pixie Bob is a domestic cat bred to visually resemble a wild Bobcat. Pixie Bobs share only a visual similarity with wild Bobcats and do not have anything else in common. DNA testing has proven Pixie Bobs are not descended from wild Bobcats, regardless what else you might read or hear. Pixie Bobs are very sweet, loyal companions and are very much like dogs in this regard. Learn more about the Pixie Bob breed. Breeding our Pixie Bobs to meet the breed standard is of the highest importance to us. We feel if you are breeding a purebred animal, but are not breeding to meet that breed's standard, then you might as well just be breeding any mixed breed you care enough about to breed. There is certainly nothing wrong with mixed breeds. All our dogs and cats before our Pixie Bobs were all mutts and we enjoyed them as much as we enjoy our Pixie Bobs. There is just something special about the Pixie Bob and we decided to focus on Pixie Bobs to the exclusion of our mixed breeds. Other than breeding to meet the Pixie Bob breed standard, we prefer rufus (warm) colored cats, with long hair. We like the look of polydactyl Pixie Bobs, as well, but we currently have no polydactyl breeders in our program. We are also striving to breed Pixie Bobs that are on the larger side. 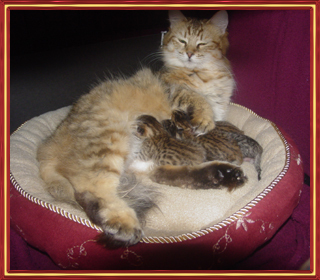 We work very hard to socialize our Pixie Bob kittens so they will bond quickly and strongly to their new families. Our Pixie Bobs, both cats and kittens, are exposed to a variety of scratching surfaces, toys, and activities. 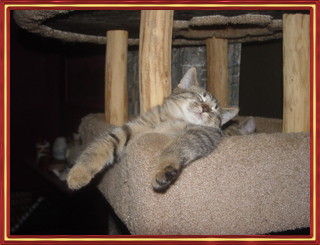 We provide cat trees with sisal rope, smooth and rough woods, and carpeting for scratching. The cats and kittens have fabric mice, bell balls, feathers, laser pointers, and more to play with. Pixie Bob kittens are always fascinated by empty toilet paper cores. Both the adult Pixie Bobs and the kittens particularly enjoy playing with the plastic rings off milk jugs and plastic Easter Eggs, especially when it's just half an Easter Egg because they slide and roll less predictably and because the Pixie Bobs can pick them up and carry them around. 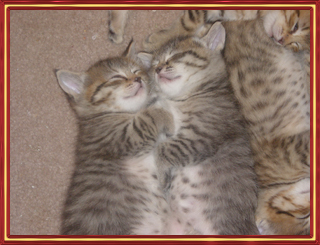 Our Pixie Bob cats and kittens are exposed to the routines and rhythms of daily life, as well. They get very used to vacuums and blenders, people coming and going, and we do our best to teach them not to beg at dinner. Our Pixie Bob cats are so accustomed to the vacuum that they simply don't bother to even move from "their spot" when it's on, even if "their spot" happens to be in the vacuum's path! We also teach the Pixie Bob kittens not to scratch on curtains, speakers, furniture, and other disallowed items. Pixie Bobs are not very interested in scratching on carpeting, even when it is on their cat trees, which means there isn't much teaching required to train them not to scratch carpet flooring. So, your Pixie Bob kitten should quickly and easily adjust to life in your home. We feed our Pixie Bobs the highest quality dry kibble we can find. We do not believe in "raw diets", and our cats and kittens are fed "Rocky Mountain Feline Formula" from Taste of the Wild. This is a high protein food (42%) and it is high in Omega-3 and Omega-6 fatty acids. High protein content enables the Pixie Bob kittens to grow large quickly, develop strong muscles and bones, and help the Pixie Bobs grow soft, thick coats. Omega-3 and Omega-6 fatty acids are particularly responsible for the beautiful sheen everyone likes to see so much and also help the Pixie Bobs grow luxurious coats (among other benefits). Our Pixie Bobs are free fed to ensure they are able to eat any time they are hungry and to ensure they always walk away satiated. We weigh our Pixie Bob kittens frequently as they grow to ensure they are gaining a proper amount of weight and because weight is often the first indicator of health problems, especially in baby animals. Our Pixie Bobs are not discouraged from exploring new places and things because we want them to exercise their minds, as well as their bodies, and we especially do not want the kittens to grow up afraid of new places, people, and things. Of course, this isn't to say we can guarantee the kittens won't be timid as adult cats. Our Pixie Bobs are regularly veterinarian checked and inoculated. Our female breeders are not mated in back-to-back heat cycles to ensure they are in optimum health when they are mated. We do not dock our Pixie Bob kittens' tails because we consider this to be inhumane due to the fact that kittens' tails are nearly fully formed when they are born and this causes nerve and muscle damage. A docked tail does not feel, look, or move naturally. A Pixie Bob with a docked tail can experience phantom tail. In fact, we have had a docked tailed female who had such a bad case of phantom tail that we couldn't pet her all the way to her tail without her trying to attack us. All our Pixie Bob kittens are either reproductively sterilized before they are sold or they are sold with a contract addendum requiring the new owner to reproductively sterilize the kitten - typically by the time the Pixie Bob kitten is 6 months old. We do this for several reasons. First, it is important to prevent unplanned breedings and also to hinder "backyard breeders". Second, sterilization is a step toward preventing medical and/or behavioural problems. Female Pixie Bobs can suffer from uterine infections if they are neither spayed nor bred. A male Pixie Bob's urine is particularly foul smelling if they are not fixed and they may also take to "spraying" around your home in order to mark their territory. Males who are allowed to reach sexual maturity prior to being neutered also understand the odor of a female in heat, even after they've been neutered, while those who are neutered prior to sexual maturity will never have a clue what the female's pheromones signify. It comes down to this, really: Pixie Bobs not in a cattery's breeding program make better pets when they are sterilized. Finally, we microchip all our Pixie Bob kittens and provide their owners with their microchip number. We do this for a couple of reasons. First, it makes recovery of your Pixie Bob easier should they get lost. Second, it allows shelters, humane societies, and rescue organizations to contact us should they find one of our Pixie Bobs. This enables us to assist in finding that Pixie Bob's purchaser or, if we are unable to locate the original purchaser, then it allows us to be involved in the rescue and adoption of that Pixie Bob. Microchipping is a non-optional part of life for our Pixie Bob kittens and we know those who have purchased kittens from us appreciate the extra security this provides. Please take your time browsing our site and ask any questions you might have. 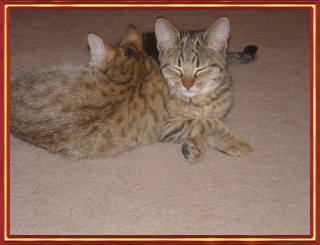 You can also view our Pixie Bob kittens for sale and Pixie Bob cats for sale. You may ask questions, make suggestions, and offer feedback either by using our email addresses at the top of each page or use our contact form.